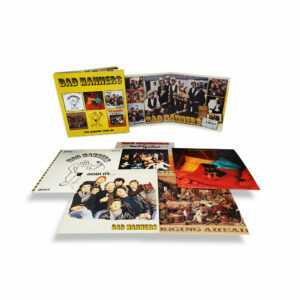 Boxset bringing together the five albums released by Ska band Bad Manners during the early 80s, each enhanced by relevant bonus tracks…LTW’s Ian Canty recalls a time when the year’s most successful Pop act (when judged on weeks on the UK singles chart) was fronted by a self-confessed “Skinhead yob”…. There was and perhaps still is a tendency to dismiss Bad Manners as a sort of “cut price” Madness, comedy Ska cashing in on the Two Tone boom. Simple radio friendly ditties that appealed to Pop fans, but with none of the cutting social comment of the Specials etc. The band however had a history which stretched back to 1976 and a clear love and aptitude for the music. To me they were, for the first three years of the 80s at least, a ruthlessly efficient hit machine, clocking up 53 weeks on the chart in the calendar year of 1980 and scoring five hit singles plus two albums. Unlike the other smartly dressed Two Tone bands, the Manners looked like they had met in a bus queue, much like Kilburn and the High Roads before them. Appearances were deceptive as the lack of sartorial eloquence was contrasted by the sharpness of the nine-piece band’s musical capabilities. In fact they were arguably the act that caught Ska most authentically of the 79/80 mob, with a full brass section helping give their sound a pleasing depth, moving them far away from the rank of 1979’s more tinny skanking recruits. Though they had gained mastery in the short form, LPs though were a thornier problem for North London’s most unlikely Pop idols. A case in point would be the debut LP Ska ‘N’ B. Though entertaining enough it is a little lightweight (gulp! ), with cover versions dominating over originals. When you consider the quality of the material Bad Manners could come up under their own steam, you wonder why that should be. The singles Special Brew and Lip Up Fatty were both killer tracks and much deserved hits too with Here Comes The Major and the more serious Inner London Violence catching the period as well as most. There was always room for a bit of Bonzos-style quipping among the frenetic Ska shuffles, the 40s dreamboat style Scruffy Was A Huffy Chuffy Tug Boat ending the album on a surreal note. Loonee Tunes arrived quickly in the same year and in some ways followed the same pattern. In most ways though it is an improvement – more originals and little twists, for example Echo Gone Wrong is a highly successful foray into Dub Reggae, you probably wouldn’t guess the band if you didn’t know it was Bad Manners beforehand. The second half of the album itself is the stronger, with the daftness of the lyrics of The Under Sea World of Ivor The Engine not taking anything away from the dramatic musical setting and Suicide showing that despite the “fun” trappings they were averse to looking at the dark of life. This LP yielded two good singles in Lorraine (the 12 inch version and a new recording of Here Comes The Major make up the bonuses on this disc) and Just A Feeling, accompanied by television appearances with Buster playing up the comic value with increasingly more flamboyant costumes and props. This undoubtedly contributed to Bad Manners being seen purely as a comedy band, which was selling themselves a bit short, but as the hits kept coming I doubt they cared a jot. Gosh It’s..Bad Manners is probably the best of the five presented here. Everything came together for them and it was all topped off by their most successful single, a version of the old burlesque number Can Can. Buster excelled himself with his performance on Top Of The Pops and another neat single Walking In the Sunshine made the Top 10 too. Elsewhere Weeping And A Wailing could be viewed as the old “tears of a clown” routine, but a busy and addictive melody takes it away from the maudlin and Casablanca (Rags To Riches) adds a touch of Exotica to the mix. Ben E. Wriggle is a stomping R&B strut and Runaway proves that not all of the Manners’ catchy numbers were singles. Among the bonus tracks on this one is the Special R ‘N’ B Party Four EP. The lead track Buona Sera powered this extended play into the UK Top 40 and the short and brassy original The New One was a goodie too. The Can Can’s flip Armchair Disco is in The Liquidator mode and Walking In The Sunshine is a joy to hear in any format, the extended version adding a little more drop-out instrumental frills. 1982 saw the release of Forging Ahead and this one signalled a downturn in their fortunes in the UK charts. Things were changing and Bad Manners had clearly noticed. This was not always a positive thing, a couple of weak attempts at mid-80s Pop/Funk in the shape of Salad Bar and Tonight Is Your Night don’t exactly get the LP off to a blazing start. However things pick up with the Samson And Delilah single, not quite as immediate as their best, but should have cracked the Top 40. Their version of Millie Small’s My Boy Lollipop was their last stand at the top end of the charts, to me at the time it seemed a bit of a desperate measure going for such an obvious cover in order to get a hit, but it is a decent enough version (though the 5 takes we have over this and the Mental Notes disc are stretching it a bit!). Falling Out Of Love, with some smart female backing vocals is the kind of off-beat song-writing where the band were at their best, sawing through the stereotypical love song backwards. Educating Marmalade doesn’t really fit with the rest of the album at all, the theme from the TV show of the same name, but the operatic tinge to Rose Of Italy is fun and Exodus is a nice dig around the band’s old Ska roots. The Got No Brains single failed to crack the chart as well, two years previously though it would have probably made the Top 30, but times had changed. As it was, the stand-along That’ll Do Nicely single was their last hurray in the UK singles listings (a compilation of their hits The Height Of Bad Manners did hit the Top 30 in the album charts later), a good record that again fell a little short. It is among the bonuses here along with an instrumental version of their theme for the Pauline Black-helmed kids quiz show Hold Tight entitled Your. After an action packed couple of years that saw the release of these four albums, various singles plus tours and appearances, there was an inevitable comedown. They parted company with their record label Magnet and signed to Portrait, an off-shoot of the huge Columbia company. It was three years before the Mental Notes album appeared in 1985 and this LP wasn’t exactly a return to form, but did contain some decent, catchy songs. Opening track What The Papers Say to me sounds like an unsuccessful attempt to update their sound with some tinny 80s effects and a Rap/Funk feel. It really doesn’t work and although Body Talk is better, it still feels like bolt-on technology stifling the potency of the band. Bad Manners could still on occasion surprise, like when they cover Todd Rundgren’s Bang The Drum All Day and a good job they do on it too. The cool Tossin’ In My Sleep skirts innuendo, but is pretty good and Saturday Night is a rollicking return to the old Bad Manners style. The Blue Summer single shows that they hadn’t completely lost their touch, but after that and the parent LP missed out on the charts the band folded. There was no route back for them to the top in the much changed environment of 1985. Of course this split didn’t last for long, the band reformed for the Return Of The Ugly album in 1989 and have performed live more or less ever since with various recordings along the way. This new collection brings most everything a fan could want – the Mental Notes album is pretty rare and while not being the band at their very best, does have a few worthwhile attributes to it that warrant investigation. Bad Manners were, for the period of time that The Albums 1980-85 focusses on, a well-oiled (probably in both senses of the phrase!) chart-smashing steamroller and while the albums weren’t quite classics they were enjoyable enough and suggest there was more to the band below the surface. At their best (despite the clowning) they were as good as any at crafting records that could worm their way into the subconsciousness of even the hardest and hippest heart and these songs still are potent all these years on. A wonderful review, bought this CD collection last month and can’t wait for the arrival. I disagree about Salad Bar, I think it is one of the best tracks from Forging Ahead. Regarding Mental Notes, it’s far from perfect, but you have highlighted the best tracks. Love me some Blue Summer. And as uneven as this album is, it’s still much better than Fat Sound, from 1992. Indeed, Bad Manners were/are an underrated act. Incredibly tight live, with some great songwriters in the band and some standout album cuts. I’m particularly fond of Forging Ahead, with the single/12″ Samson & Delilah and the album track Seventh Heaven. Tossin’ In My Sleep from Mental Notes could have been at least a top 30 hit had it been thought up during the band’s heyday. This is a welcome release without doubt.